The Mens Sesvenna Shorts from Vaude, are great for extra protection of heat for the mountains: knee length shorts with PrimaLoftSilver Insulation Eco fill that can be easily pulled over your ski touring trousers when conditions get frosty. They need hardly any space, weigh next to nothing and raise spirits up when temperatures at the peak start to drop. The elastic waistband keeps them fitting just right. Two side zips ease on and off action, and an integrated snow skirt at the knee keeps snow out when you're carving down the slopes. 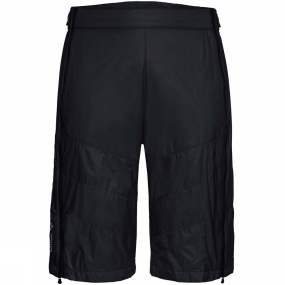 These insulation shorts are also a great choice to have along when you're belaying or bivouacking in the cold. This product is made with Eco Finish, an environmentally friendly water-repellent finish without fluorocarbons (PFC). Green Shape is your Vaude guarantee for environmentally friendly products - made from sustainable materials, with resource-saving manufacturing and in fair production facilities.